Arup’s Cardiff offices were recently upgraded with a multi-functional presentation suite, installed by South Wales-based integrators Vaughan Sound. The technology provides the environment to showcase Building Information Modelling (BIM), videoconferencing, and corporate entertainment. The focal point is a landscape videowall comprised of 15 Samsung UD55D premium large format displays with 3.5mm bezels, color calibration and LED backlighting technology. 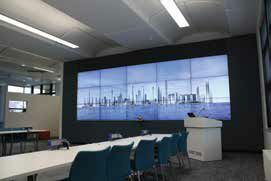 Arup Cardiff office upgrades include a Barco ECU-110 videowall processor and AMX solutions. The control and video routing system includes a Barco ECU-110 videowall processor and AMX solutions. For audio processing, Vaughan Sound installed a Symetrix Radius AEC digital sound processor, alongside a Denon DN-500AV surround sound decoder and two Yamaha XM4080 four-channel audio amplifiers. Tannoy and JBL Control 1 in-wall loudspeakers were chosen to complement the processing and create an immersive sound field, and a Univox PLS-100 induction loop amplifier was fitted for those with hearing impairments and DDA compliance. Two collaboration systems have been integrated, which are independently selectable from the control system. One is set up to use Arup’s own network for internal use, the other to an external network for guest use. A Cisco C40 Codec and Precision Camera have been paired with two WePresent 2000 wireless presentation receivers and a Blu-ray Player. System control itself is facilitated via an iPad, which hosts a specialist app and GUI. This allows easy and intuitive management; including power on/ off, use case and display configuration changes, input selection, and audio level. The iPad is stationed at the presenter position that includes a modern lectern, Audio-Technica gooseneck microphone and 10-inch monitor offering HDMI, DVI, VGA, YPbPr, S-Video, and composite video functionality. Duncan Proctor is a staff writer for Installation magazine, SCN’s sister publication based in the United Kingdom.